The above graph shows occurrence rates of radiolucent findings in apical areas after root canal treatments (i.e. 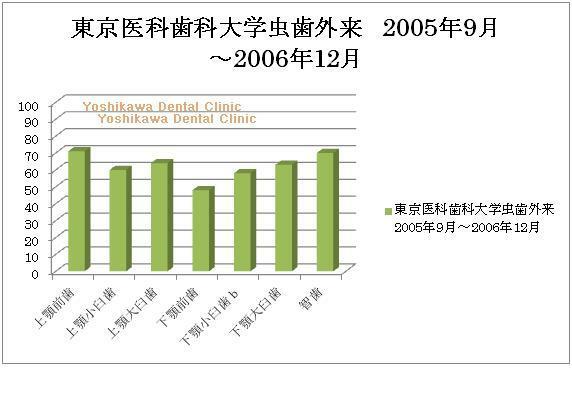 failure rates of these treatments), surveyed at the Outpatient Department for cavities of the Tokyo Medical and Dental University Hospital. More specifically, this graph shows the incidence of lesions in apical areas, which were found in x-ray exams when patients, whose dental pulp (the nerves and blood vessels) had been removed. This discovery took place when patients visited the Outpatient Department. In other words, this is the rate of failures of the previous treatments. he above figure implies that only 30-50% of the root treatments are successful. This is like a batting average of Ichiro, a baseball player. In other words, 5 to 7 out of 10 cases are failures. In a nutshell, the success rates of root canal treatments are 30-50% as these are not profitable in Japan, and these failed treatments are associated with the fact that aseptic procedures have not been taken as dentists cannot spare enough time. We highly recommend American style root canal treatments using microscopes, as those of Japanese dentistry with such low success rates and 5 out of 10 cases can fail.